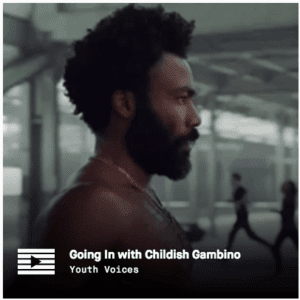 Childish Gambino’s video, “This is America,” is by Donald Glover. He created this music video because he trying to tell society that people back then had issues with slavery and how they had a lot of racism going on back then, and he’s showing us how right now we still have people who are racist and we shouldn’t be quiet about it. The central message in this video is about guns and violence in America and the fact that we deal with them and consume them as part of entertainment. And because of events like the Sutherland Springs church shooting and the Stoneman Douglas High School shooting, violence, especially gun violence, has become part of our national conversation. One part of the video that stands out for me was when the Gambino character is trying to illustrate how people don’t pay attention to things that are happening around them. One of the many things that Gambino shows in this video is how violence is taking over our communities and society and how people don’t pay attention to things that are happening now. This stood out for me because people don’t pay attention to things that are happening in society they try to be blind and pretend like nothing happens. Donald Glover’s music video reminds me of something that I made once. One time I had to write an essay about violence and how violence can affect society and even our community. Glover’s music explains every issue that happened or is happening now. He is trying to tell us through his music. I think that what Gajana said is true because what Gambino was illustrating what happened before and that these things are happening now, like black people getting accused of everything wrong that’s happening in society. I’m glad Donald Glover made this video. I look forward to seeing what he makes next, because what he did in the video, “This Is America,” is he made me realize that we are going through those things and we just have to pay more attention to it. What’s happening now by Ronaysi is licensed under a Creative Commons Attribution-ShareAlike 4.0 International License. Robots in the futureWhat does it mean to be an american ? I liked when you said “people don’t pay attention to things that are happening in society they try to be blind and pretend like nothing happens.” I feel like that was one of the main messages in the music video. I think that people need to be more aware of other’s problems instead of just their own. I like that you talked about Childish Gambino’s music video and how it connects to violence in America. I have also watched the music video and really like how he showed how all these horrible things are happening in our world yet the media tries to make everyone ignore it and not see it. Here’s a link to an article by rolling stone talking about how Donald Glover is bringing light to a conversation people want to ignore. 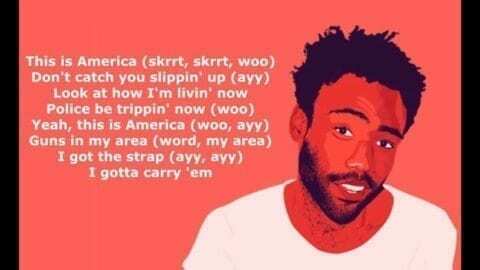 (https://www.rollingstone.com/music/music-news/donald-glovers-this-is-america-is-a-nightmare-we-cant-afford-to-look-away-from-630177/). I really liked this article and i hope to read more articles by you. You did a great job breaking down his philosophy and the message he was trying to show.